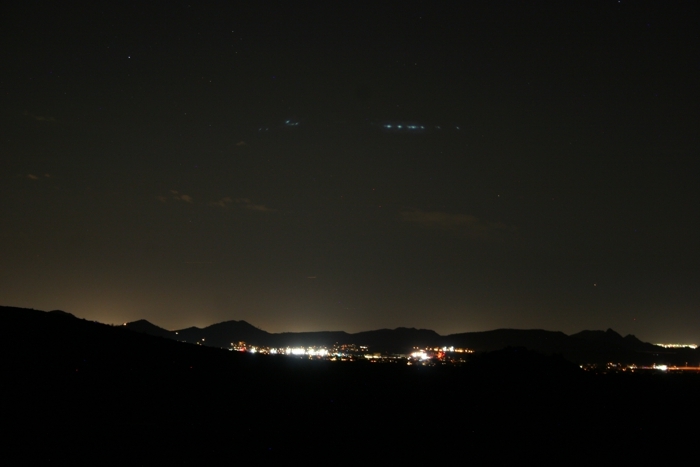 I walked out on the deck last night around midnight just to check the sky, and saw an unusual display of lights above Anthem, AZ, about 4 km to the south. I wasn’t sure what they were at first, since my eyes were still adjusting to the dark, but I knew it was worth capturing. So I quickly assembled my Canon 20D with its standard 55 mm lens on a tripod. Shooting on full auto, each exposure was 8 seconds at f/5.6 and ISO 400. The slideshow above is the first thing I captured. Scroll back and forth in the slideshow and watch for subtle changes in the “floating lights”. What are they? Note to readers: This post runs almost 1400 words. That’s because it’s effectively a “lab report” detailing an ongoing scientific investigation. If you follow it to the end you’ll see the scientific method in action. You’ll also see that a definitive explanation still eludes us — though we did narrow it down to two possibilities. Now, back to those strange lights … my first thought was laser pointers reflecting off a thin cloud, but after watching for a few minutes I could see the colors weren’t right. Then I wondered if it was some of those floating lanterns with candles in them, or maybe drones with running lights, but the motion wasn’t right. Another possibility was a low cloud of ice crystals reflecting lights from the city below, but the temperature wasn’t right. Here’s a later sequence in a different part of the sky. Again, scroll back and forth and watch for subtle changes. This display was totally different. There’s a line of relatively stationary floating lights, and a group on the left that blinks on and off. Watch for changes in the floating lights that seem to be synced with lights on the ground. From the timing and grouping, they almost look like a traffic signal changing, or possibly the headlights of a moving vehicle. This last sequence was about 10 minutes later. 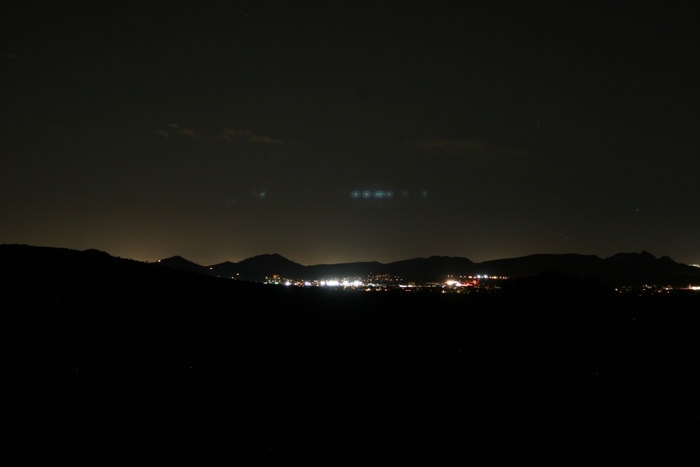 Now the floating lights are lower in the sky and seem to have pronounced “coronas” around them. But they’re still synced with the lights in the city. At this point I was fairly certain it was a superior mirage. The only problem was, I’d never seen one elevated so high into the sky — nearly 12° at first sighting. I wanted to explore further, so I started with a new feature on Google Earth Pro. You can draw a path (not a ruler) between any two points. First use Add > Path, then draw the path, then use Edit > Show Elevation Profile. The output will be a chart showing a cross-section of the topography between the endpoints of the path. I copied that chart into a graphic to show the mirage geometry. This needed to be a large graphic, so it’ll open in a new tab when you click on it. Note that the horizontal scale of the topography is compressed by a factor of 10. Light from sources in Anthem was being refracted by a strong temperature inversion. This made the light appear to be coming from a location above the actual source — it was a superior mirage. For comparison, check out this inferior mirage. Light always curves away from warm air and toward cool air. If you want to know why that happens, Wikipedia has a nice explanation here. So I could see the lights at ground level directly, but the brighter ones were being duplicated in the sky above. There are multiple paths any light ray could take to reach my eye, and the “direct” path in that graphic probably wasn’t a straight line either, hence the “?” interruption. Those “direct” lights were probably also elevated relative to normal. What clinched the superior mirage hypothesis was how changes in the floating lights were synced with the lights on the ground. Especially in that first slideshow. 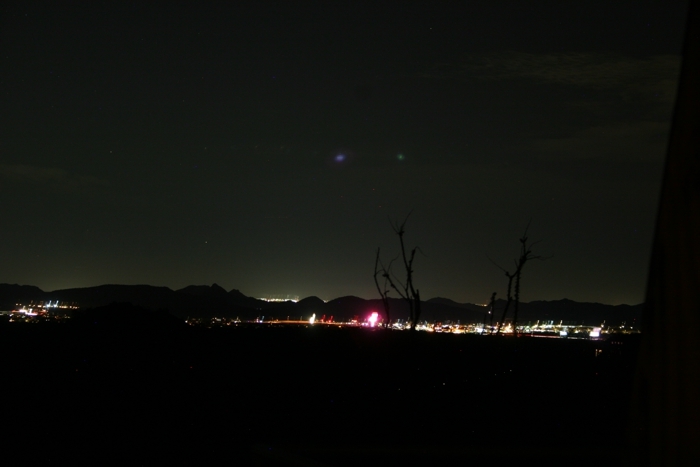 The source of that light was a bright electronic billboard near an outlet mall. The display changes every 10 seconds or so, and each display has different prominent colors depending on the ad. Watch the floating light and the billboard and you’ll see that synced color change. I felt confident in this explanation, but then started having second thoughts about that extreme 12° elevation. So I emailed the images to Les Cowley who runs the website Atmospheric Optics to get a second opinion. I’ve found a lot of valuable info there, and corresponded with him directly several times on especially puzzling phenomena. 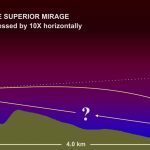 Cowley agreed that 12° is an extreme elevation for a superior mirage, and noted that most superior mirages are slightly stretched in the vertical direction. There are some exceptions — look at this example of an optical phenomena called looming. When I zoom in on my photos I see no stretching, so it could have been extreme looming, but looming almost always occurs over water. 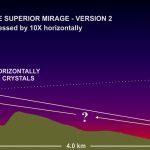 Cowley suggested that the superior mirage might have been a reflection from the underside of a layer of flat ice crystals suspended in the air. I modified my original graphic to illustrate his hypothesis. For simplicity, only a single crystal is shown. As it turns out, reflection could also create the mirage I had earlier attributed to refraction. Click to enlarge. The law of reflection mandates the incident (incoming) angle to be equal to the reflected (outgoing) angle. That geometry requires the layer of ice crystals must have been just overhead at my location. The temperature here was around 12°C (54°F), but there was a north wind that night, and the New River Mountains (elevation 1500m) could have been the source of that ice-laden air. It’s worth noting that as the air mass carrying those ice crystals descended into the valley the mirage would have lowered in elevation, and that’s exactly what my photos show. A few minutes after the last photo sequence, as the air mass reached an even lower (warmer) elevation, the ice melted and the mirage quickly faded away. To further muddy the waters … just last night out on the deck I noticed another light floating above the electronic billboard. It too was synced in color with the changing ads. But it wasn’t as elevated as the others, maybe only 4–5° elevation. It was also very faint in comparison — almost transparent. I could see the Anthem sky glow through it. Note there was no chance of any ice crystals given recent 27°C (80°F) temperatures. I tried to photograph it, but it was too close to the billboard and my camera (on auto) underexposed the mirage. So what’s going on here? Refraction or reflection? To be honest, even after an extended exchange, Cowley and I could not come up with a definitive explanation. Either could have happened. When you see a transient phenomena like this and can’t “go back” to make additional measurements, sometimes you just have to accept it as a mystery. Some might call that a “failure” but most scientists see mysteries as one of the things that makes the natural world interesting and worth observing. Nonetheless, trust that I’ll be continuing my observations. The idea seems entirely plausible to me, since the Vikings didn’t have magnetic compasses or mechanical clocks. Also, their knowledge of celestial navigation was rudimentary. They could use Polaris to find north and get a measure of their latitude. But when they sailed west they had no way to measure longitude. Superior mirages of land masses along their route of exploration may have helped established waypoints.